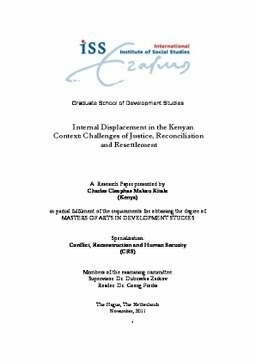 This research is concerned with the actions of reconciliation and justice pursued by different institutions and actors, following the post-election violence in Kenya in 2007/2008. Many different institutional and community actors have played different parts in the reconciliation efforts and pursuit of justice: the Kenyan government and its different ministries, the local, national and international civil society organizations and international agencies such as UN, the International Criminal Court (ICC), the internally displaced people and their host communities. My main interest was to examine the actions regarding reconciliation and justice by the state, and see how its actions foster justice, reconciliation and peace building after the violence. To do so I also look at some of the national actors involved in reconciliation and justice efforts, and at their criticism of and involvement with the state. Finally I look at the situation of the IDPs and their experiences of violence as well as post-violence interventions by the state and civic justice and reconciliation actors. Findings generally indicate that the state has done little to improve the situation, while other actors have done little to motivate or control the state. Internally displaced have lost all faith and hope in state initiated justice and reconciliation efforts, and this has been aggravated further by the well entrenched culture of impunity. Furthermore more political inertia in addressing the issue, continuing incitement by the political elite and the lack of inclusion of politicians in peace meetings has contributed to lingering possibilities of resurgence of violence due to unresolved underlying economic, social and political issues. The continuing skewed distribution of resources (such as land) and opportunities along ethnic and socio economic strata as well as perceived bias in humanitarian assistance along the same lines has led to animosities festering between neighbours and IDPs, both landless and landed. Ultimately, while reconciliation among various grassroots communities has been cited as the most preferable pathway towards a lasting peace and attainment of a stable society, its achievement remains uncertain.